Senegal is a diverse West African nation approximately the size of South Dakota and home to more than 36 ethnic groups and languages. Senegal’s national development has been shaped by its location between the edge of the Sahara and the Atlantic. Trans-Saharan trade brought Islam and Arab influences to Senegal through North Africa. Later, Senegal became one of the first African countries to trade with Europe through the Atlantic seaways. Today, Senegal is seen by the Senegalese as a bridge between Black African, Islamic, and European civilizations. Indonesia is a geographic mixing point between the traditional Malay peoples of most of Southeast Asia and the Austronesian peoples to the east. The country’s territory stretches thousands of miles from east to west and has a centuries-old history of settlement and interaction with the region and rest of the world. 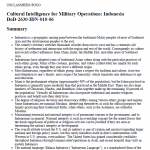 Consequently its culture and society reflect influences from China, India, the Middle East, and other areas of Southeast Asia. 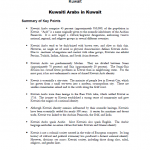 Kuwaiti Arabs comprise 45 percent (approximately 950,000) of the population in Kuwait. “Arab” is a name originally given to the nomadic inhabitants of the Arabian Peninsula. 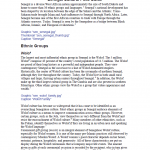 It is now largely a cultural/linguistic designation, embracing various national, regional, and religious groups in several different countries. 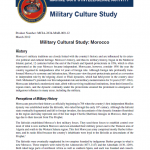 Morocco’s military traditions are closely linked with the country’s history and are influenced by its extensive political and cultural heritage. Morocco’s history, and thus its military history, began in the Medieval Islamic period, 12 centuries before the end of the French and Spanish protectorate in 1956, which is often represented as the year Morocco became independent. Moroccans, however, consider 1956 the year the country regained its independence after 44 years of foreign rule. Although foreign rule profoundly transformed Morocco’s economy and infrastructure, Moroccans view the post-protectorate period as a reversion to independent rule by the reigning Alawi or Filali dynasties, which had held power in the country since 1660. Mohamed V presided over this independent rule and military modernization for 34 years (1927–1961). Moroccans inherited a modernized state, albeit with surviving traditional institutions, from their former European rulers, and the dynastic continuity under the protectorate ensured the prominent re-emergence of indigenous influence in many areas, including the military. 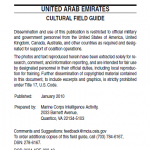 The United Arab Emirates Cultural Field Guide is designed to provide deploying military personnel an overview of UAE’s cultural terrain. 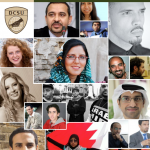 In this field guide, UAE’s cultural history has been synopsized to capture the more significant aspects of the country’s cultural environment, with emphasis on factors having the greatest potential to impact operations. 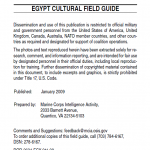 The Egypt Cultural Field Guide is designed to provide deploying military personnel an overview of Egypt’s cultural terrain. In this field guide, Egypt cultural history has been synopsized to capture the more significant aspects of the Egypt cultural environment, with emphasis on factors having the greatest potential to impact operations. 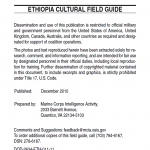 The Ethiopia Cultural Field Guide is designed to provide deploying military personnel an overview of Ethiopia’s cultural terrain. In this field guide, Ethiopia’s cultural history has been synopsized to capture the more significant aspects of the country’s cultural environment, with emphasis on factors having the greatest potential to impact operations. The Qatar Cultural Field Guide is designed to provide deploying military personnel an overview of Qatar’s cultural terrain. In this field guide, Qatar’s cultural history has been synopsized to capture the more significant aspects of the country’s cultural environment, with emphasis on factors having the greatest potential to impact operations. 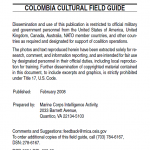 The Colombia Cultural Field Guide is designed to provide deploying military personnel an overview of Colombia’s cultural terrain. In this field guide, Colombia’s cultural history has been synopsized to capture the more significant aspects of the Colombia cultural environment, with emphasis on factors having the greatest potential to impact operations. 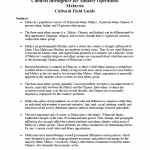 Malays are predominantly Muslim, and as a result, the country is strongly influenced by Islam. Most Malaysian Muslims are moderate in their views. They do not want Malaysia to become an Islamic state, and regard Islam primarily as a religion, not a lifestyle. Some of Malaysia’s smaller religious and ethnic groups are concerned about what they perceive as the increasingly Islamic nature of Malaysian society. 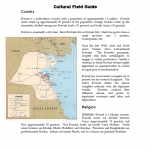 A cultural field guide for Kuwait produced by the Marine Corps Intelligence Activity in May 2003. 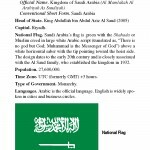 A cultural field guide for Saudi Arabia produced by the Marine Corps Intelligence Activity in May 2003. 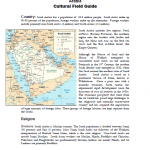 This handbook provides basic reference information on Saudi Arabia, including its geography, history, government, military forces, and communications and transportation networks. 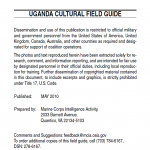 This information is intended to familiarize military personnel with local customs and area knowledge to assist them during their assignment to Saudi Arabia. 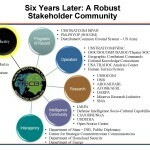 Understanding human dynamics is an essential aspect of planning for success across the full spectrum of military and national security operations. While the adage that “warfare is political conflict by other means” is widely recognized, combatants who underestimate the impact of the human element in military operations do so at their risk. During the Second World War and the reconstruction that followed, as well as during the Cold War, understanding human dynamics was considered essential. 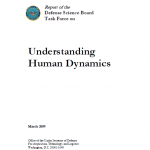 As conceptualized in this report, the term “human dynamics” comprises the actions and interactions of personal, interpersonal, and social/contextual factors and their effects on behavioral outcomes. Human dynamics are influenced by factors such as economics, religion, politics, and culture. Culture is defined herein as the particular norms and beliefs held by every human, that impacts how individuals, groups and societies perceive, behave and interact. 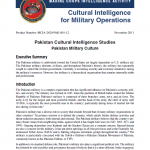 A presentation from March 2013 on the DoD’s sociocultural behavior analysis and modeling technologies and the Human Social Culture Behavior Modeling program. 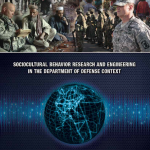 Significant progress has been made toward building a DoD capability for understanding sociocultural behavior, and some solutions have been delivered to military end users. However, there is much work to be done. The complexity of human behavior defies easy understanding or reliable forecasting. 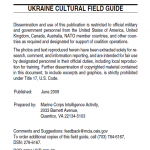 In the context of irregular warfare, counterinsurgency, post-conflict recovery, or any other mission setting of the Armed Forces, technology—including computational models—is essential to support decision making. That technology must be rooted in well-validated, inter-disciplinary theory, and applied appropriately, with recognition of its strengths and limitations.